In this post, I am going to pretend you didn't read the 5K, 10K, or half-marathon post, because I really don't want to leave anything out. A full marathon is a BEAST, and I want to make sure I include everything that helped, whether I mentioned it before or not. If I forget something anyway, feel free to leave a comment or shoot me an email! *Sounds obvious, but please don't make a marathon your first race. Ideally, do some 5K's, 10K's, and half-marathons before tackling a full. *Don't think of a full marathon as "just like a half, only twice the distance"... because the full is an entirely different animal. Everything you thought you knew about your body during half-marathon training will likely change as you train for a full. *Choose your race wisely, depending on your goals and personality. Do you want a large, crowded race with a ton of crowd support, or would you prefer a small, hometown feel? Are medals and shirts, and other race swag, important? Is there a time limit, and will you be able to finish within that allotted time? Do you want a trail race, lots of hills, or a Boston-qualifier? Fall or Spring? Just make sure you do your research to choose a race that fits your needs. *Choose a training schedule that fits your wants/needs (or hire a running coach to write a schedule for you). I always recommend Hal Higdon's Novice 1 plan for beginners, but there are a lot of good plans out there. I've done three different plans for three different marathons, and my personal favorite is Hansons Marathon Method (you can read my review of it here). It's not practical for everyone, because it takes a lot of time. But the decision really depends on your own needs and wants! *On a good training plan, most of your training will be at "easy pace", or "conversational pace". Basically, you should be able to carry on a conversation while running. You may do some speed work once a week, but the majority of your mileage is really all about the time spent on your feet, getting in those miles! Please read The Importance of the Easy Run. *Prepare for marathon training to pretty much take over your life for 18 weeks. You will be thinking, eating, and breathing running for a few months! *Use your long training runs as a way to test out what you're going to wear, eat, and drink on the big day. Dress in the clothes you'd like to wear for your race, experiment with different fuel options, and practice doing everything you would as if it was race day. It helps to see if you chafe with certain clothing, or your stomach rebels against Gu, or you can only handle a particular flavor or ShotBloks. *Plan on using the water stations to your advantage during the race. Start fueling/hydrating as early as possible in the race (from the very first station! ); you can look up on the race website exactly where the water stations will be, so that you can plan to practice fueling at those points during your long runs. I highly recommend eating or drinking something at every station from the very beginning, whether you feel like you need it or not. You are going to need that fuel later in the race, so stock up while you can! *Running your first marathon is a very big deal, so if you want your family and friends there to support you, make sure you let them know! If they aren't runners, they probably won't know how important this is to you--so tell them. They won't know what you expect of them unless you spell it out. *If you'd like, try to find a training partner to do your long runs with. 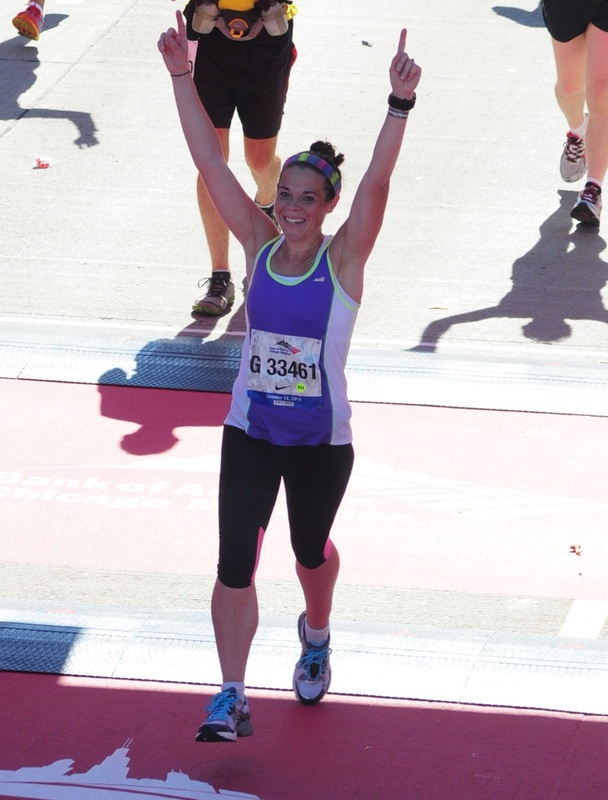 Running 16, 18, or 20 miles is hard enough--but doing it alone takes a lot of mental strength! 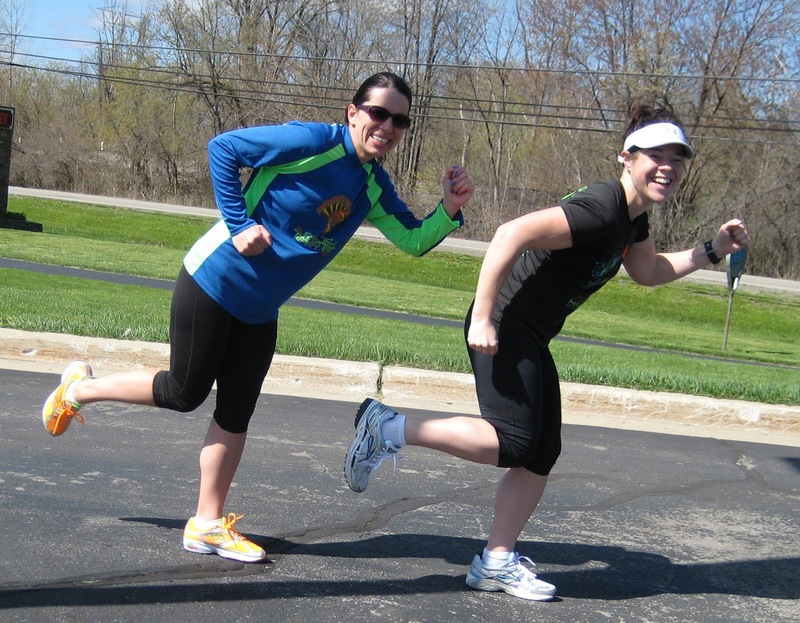 If you have a friend to run with, the miles will go by much faster, and you will probably train at the proper pace (a "conversational" pace is best for your long runs). *You'll either need to carry water/fuel with you, or plant it along your route ahead of time, for your long runs. There are a number of ways to carry it with you, and everyone has different preferences. Personally, I adore my Camelbak Marathoner Vest for runs over 10 miles (here is my review of it); for shorter runs, I like my Amphipod Handheld water bottle. Some people prefer a hydration belt, which you wear around your waist to hold water bottles. It's up to you whether you want to wear it during the race itself or not. I usually decide that based on how many water stations there are, and how far apart they are during the race. *Even if you forgo the hydration vest/belt/bottle for the race, you will probably want to carry some "stuff" with you--Gu, ShotBloks, other forms of fuel, your ID, a phone, etc. For the Detroit Free Press Marathon, we even had to carry passports to cross the border! There are a thousand different belts and pockets out there to choose from, but my personal favorite was actually recommended to me by a lot of my blog readers. I bought one at the expo for the Chicago Marathon, and I LOVE LOVE LOVE it!! It's called the FlipBelt , and it's basically a belt that you step into and pull up around your hips or waist. There are little slits in it to slide your stuff in. I was able to fit my driver's license, iPhone, 2-3 Gu's, and 2 full packs of ShotBloks... at the same time! It never bounces, and it fits flat against your body. Love this belt! *If you are someone who thrives on spectator support, you may want to consider getting your name printed on the front of your shirt. You will likely get a lot of spectators cheering for you by name, which will give you some pep in your step! *Be prepared for all types of weather on race day. If it's raining, have a friend or family member be ready with a dry pair of socks and shoes for you to change into on the course. If it's much more hot or humid than you expected (I feel so sorry for you--that's what happened at my first marathon), then plan on going much slower than you expected. Have some warmer back-up clothing prepared, just in case it's colder than you thought. Basically, prepare yourself for anything! *I learned a harsh lesson during my first marathon, so hopefully I can spare someone else by sharing it here. For my first, it was 86 degrees and very humid, with a heat index of over 100 degrees. The race was "red flagged", meaning that runners should use extreme caution running in that heat. I was worried about dehydration, so I drank a TON--lots of water and Gatorade at each station, on top of my Gu and ShotBloks. At mile 21, my stomach rebelled, and I needed a bathroom RIGHT NOW. I spent about 4 minutes in a disgusting portapotty, with the worst stomach cramps imaginable. I later learned that you should take small sips of fluid, rather than gulping a bunch at once, to avoid the cramping. Also, consuming sports drink AND gels or chews at the same time is a bad idea. You should do one or the other at each station, not both. *Pick up your race packet the day before the race, and lay out everything you'll need for the race itself. Pin your bib on your shirt, get all of your fueling supplies ready and stocked in your belt, make sure your Garmin is charged up and ready to go, and make sure you have everything you'll need during the race. *Get to the race with plenty of time to spare, so you can go to the bathroom one last time, and you won't have to be rushing to the starting line. Better early than the stress of being late! *DON'T GO OUT TOO FAST. I can't stress this enough! You will feel fantastic after a couple of weeks of tapering, but if you go out too fast, it WILL come back to bite you later. *As difficult as it may be in the moment, try to enjoy yourself. 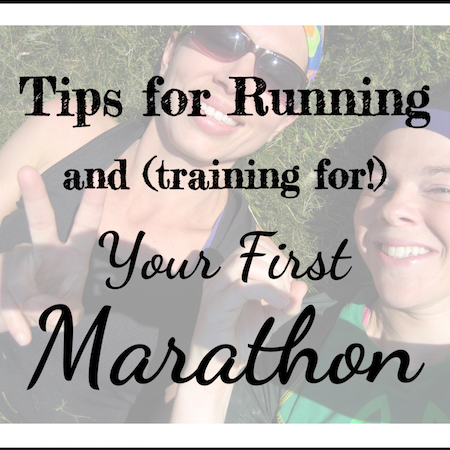 You're only going to run your first marathon once, so you want to make the best out of it! *The last six miles are going to be very tough, but you CAN do it! *When you cross the finish line, don't worry about stopping your Garmin. 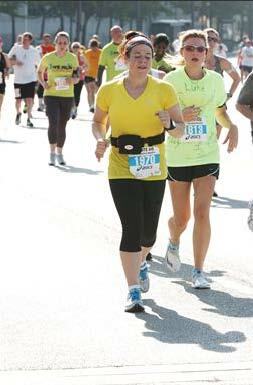 You don't want your finish line photos to be of you stopping the Garmin! Look at the camera, do something fun or goofy or inspiring, but just don't stop your Garmin until you've cleared the finish line by several yards. Yes, I show this photo wherever appropriate, thankyouverymuch! *Be prepared to be very sore, and take at least a week or two off of running entirely. Your legs will hurt like they've never hurt before. I had to use my arms to lower myself onto the toilet for a couple of days after my first marathon, because my legs were too sore! All great advice, Katie!! One of my favorite marathon 'must-haves' is a playlist on my ipod of pre-recorded cheering from my loved ones. I don't listen to my ipod while I run, but many races have sections where there is little to no crowd support. I like to be able to pull out my ipod and hear my SO's voice cheering me on or hearing my little niece shouting my name. It really helps me push through! These are great tips! A marathon is a lot of work but it is so worth it. Just signed up for my first marathon and am already nervous. Reading this post helped a lot. Thanks!! Thanks for this valuable tips Katie. It is always great to have a training partner to do long runs with in order to keep motivated. I'm sure many will be inspired by your tips and your photo. Very encouraging.